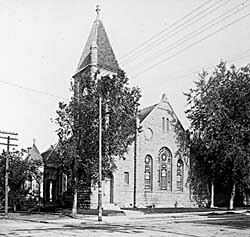 While the First Congregational Church has been a part of the community since the Society was organized in 1868, the present building was constructed from 1893 to 1894. Located adjacent to Eldora's commercial district, a short distance northeast of the Hardin County Courthouse, the First Congregational Church remains a noteworthy landmark in the central Iowa community. At the time of its construction, the building boasted a complete system of electric lighting--a total of 96 lights were in use. It was designed in the late Victorian Romanesque Revival style by noted Iowa architect Charles Durham. Durham's influence extended far beyond Iowa's borders because of his extensive practice in surrounding states and publication of his designs in national periodicals like Scientific American, American Architect and Building News, and Carpentry and Building. Church design was one of his specialties, and the First Congregational Church is one of four designed by Durham that is still intact. The Church measures 47 by 90 feet and is built of the best LeGrand hammer dressed limestone of uniform thickness. The tower is 12 by 12 feet and extends 57 and a half feet above the top of the cornice line. Door sills and steps are of the best blue stone. The interior of the Church is finished in antique oak and "hard pine." The stained glass windows remain much as they were when installed. The First Congregational Church is locally significant as a well-executed example of Romanesque Revival ecclesiastical design. 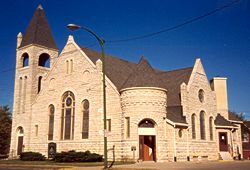 The First Congregational Church (United Church of Christ) is located at 1209-12th St., in Eldora. Call 641-939-3113 for times of services and further information.